Discussion on NosHook - Direct3D Hook / Plugins / Addons within the Nostale Hacks, Bots, Cheats & Exploits forum part of the Nostale category. Enjoy my work? Want to show your support? Why not donate? NosHook (short for Nostale Hook) is an injected third-party DLL that wraps the games graphics engine and extends the base client. 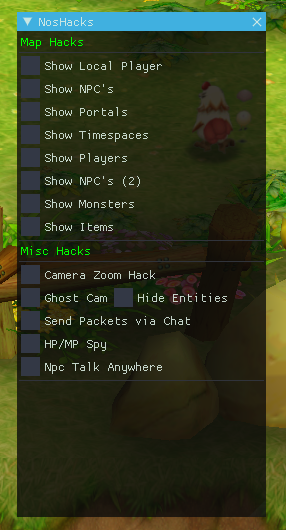 In-game console to interact with NosHook directly, while in-game. Direct3D wrapper to allow custom rendering of anything. Executable script files to allow you to run commands on the fly. Key Bindings allowing you to create your own hotkeys for executing commands. Plugins allowing anyone to create their own features and extend NosHook even more. Scriptable Lua addons allowing those whom are not savvy with C/C++ to still code their own things. Extensive font objects that are highly customizable. Full ImGui support for making in-game UIs to do anything you want. Multi-client support without any file patching or multiple exe's needed. Removal of the annoying game splash screen. Ability to enable vsync and adjust the buffering of the Direct3D device. Ability to connect to private servers easily. NosHook also has the ability to handle packets from the game. It can both block incoming and outgoing packets, as well as inject new packets in either direction as well. These features can be accessed by both plugins and addons alike. NosHook should work on any system that is newer than or equal to Windows XP w/SP3. You may need to have the latest service packet of your operating system in order for it to work. NosHook is developed with Visual Studio 2015 (Update 3), and relies on the VC++ 2015 Redist runtimes. Please note: You only need the 32bit package of this file. (The one that has x86 in the name.) It does not matter if you are on a 64bit machine, NosHook is not compiled as 64bit code. So the 64bit package will not work. NosHook comes in an archived package compressed by 7zip. You can use 7zip, WinRAR or any other archive program that supports the 7z extension to extract the archive into a new folder. You should place all the files that come with NosHook into a directory of its own, being sure to retain the folder structure of the archive. I suggest either a new folder on your desktop or something simple to remember such as C:\NosHook\. Once extracted, you need to set the install path to Nostale within the installpath.txt file. Simply open this file in notepad, and edit the path to where your Nostale.exe and NostaleX.dat file are located. You can find some generic documentation for NosHook within the /Documentation/ folder. At this time I kept things simple, however if enough interest is shown in this project, I will setup a full scale wiki holding documentation for it. Are you interested in developing plugins or addons for NosHook? Awesome! For addon development, you can find an example addon in the /Scripts/Addons/example/ folder. I, atom0s, am not responsible for anything that happens while using NosHook. characters, or accounts. You take full responsiblity while using this program. NosHook is not affiliated with Nostale, Gameforge, or any of its associated entities. Nostale is © 2007 Entwell Co., Ltd. Published by Gameforge 4D GmbH. All rights reserved. All trademarks are the property of their respective owners. I ask that people do not upload my project to other sites. I would rather have people go on my personal site for my work to prevent others from spreading fake versions that are infected. I have had this problem with past projects and do not like seeing my work being abused like this. I have made the Nostale section of my site available to guests so no registration is required. I do encourage you to register and post your support questions and such there though. I also encourage others to share their addons and plugins on my personal site as well to keep everything in a central location easier for others to find. False-positives for the injector. I can provide the src to it if needed. Better add backling to epvp, else mods have to remove the link. Thanks for the heads up, added a backlink to this thread at the top of the post on my site. Nice work. Keep it up. When i start Cheat Enginge NosHook crashes. Has nothing to do with it. But Fun fact. That's cute. My work is completely unpacked / unprotected. Feel free to debug it / reverse it and prove whatever you want to claim. There is nothing harmful in my work. If you scan the files individually, you'll see the injector is the one that has the issues, if you want me to post the source to the injector I will. It is nothing but a basic CreateRemoteThread/LoadLibrary style injector. It is not uncommon that an injection method is detected as malware regardless of the intent. - [FIX] Fixed a crash when disable_splash_screen feature was enabled. - [FIX] Fixed a small bug with displaying the current hook version via the /version command. - [ADD] Added private server support to NosHook. You can now connect to private servers with ease. - [ADD] Added icon to the injector. it ask me for d3dx9.d43ll i have directx11 and i installed visual c++ 2015 update 3 what´s wrong? In some cases on newer machines (Windows 10 mainly) you will need to install the Direct3D runtimes. how do you make it? can you share? NosPackets will probably be released next when I have some time to add a few more things to it. Currently, I'm finishing up a private bot I wrote up real fast after reversing most of the games structures and such. Once that is done I'll start releasing more things for NosHook. The file you submitted is indeed clean. Our anti-virus product had a false alarm on this file earlier, however the problem is already fixed in the latest anti-virus update. "The submitted files arecurrently not detected by our scanners." Please be sure you have the latest virus signatures installed. Another update on the virus claim, you can rescan the files with Virustotal, packages have not changed etc. and you will see clean scans now. v1.0.0.2 is still triggering false-positives, I've sent that to the various vendors as well. NosHook Direct3D Hook / Plugins / Addons What is it? NosHook is a third-party injected hook that allows users to enhance their gameplay in various ways. NosHook wraps the games Direct3D engine allowing for custom rendering of various things as well as exposes a feature rich SDK to plugins and addons. NosHook includes the ability to: Render custom font objects that are highly customizable.